Visible at latitudes between +80° and −90°. Scutum is a constellation in the southern sky. 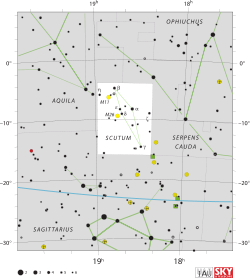 Wikimedia Commons has media related to Scutum (constellation). This page was last changed on 27 August 2018, at 04:15.